Australia has done it again- we have beaten the Poms at their own game (and I don’t mean cricket). The English climate scientists say the temperature trend for the island state of Tasmania is +0.48C per 100 years. We’ve beaten that: we say it’s +0.81C per 100 years- better by 69%! Today I looked at data now available as an interface with Google Earth. Climate researchers at the University of East Anglia have made the world’s temperature records available via Google Earth. The Climatic Research Unit Temperature Version 4 (CRUTEM4) land-surface air temperature dataset is one of the most widely used records of the climate system. Users can drill down to see some 20,000 graphs – some of which show temperature records dating back to 1850. This new initiative is described in a new research paper published on February 4 in the journal Earth System Science Data (Osborn T.J. and Jones P.D., 2014: The CRUTEM4 land-surface air temperature dataset: construction, previous versions and dissemination via Google Earth). For instructions about accessing and using the CRUTEM Google Earth interface (and to find out more about the project) visit http://www.cru.uea.ac.uk/cru/data/crutem/ge/. To view the new Google Earth interface download Google Earth, then click here CRUTEM4-2013-03_gridboxes.kml. I immediately downloaded the new interface, and can report that it is indeed useful and fascinating. Click anywhere and you can get mean temperature data and trend for that precise region, and individual weather stations as well. It allows easy comparison between the temperature record as shown by the Bureau of Meteorology (BOM) and one of the world’s leading datasets produced by the renowned Climatic Research Unit in England. 1. 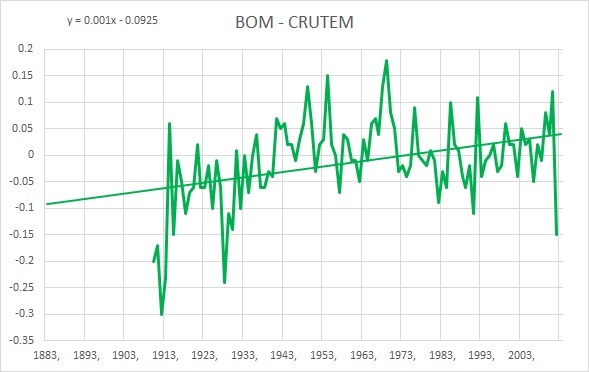 CRUTEM4 uses data from back to the 1850s- BOM says it only uses data from 1910 as data previous to this may be unreliable. 2. CRUTEM4 uses data from many more than the 104 ACORN sites used by BOM. Some may be of doubtful quality. 3. The results are vastly different. I have downloaded data from CRUTEM4 and from BOM for Tasmania, as that appears to be the easiest region to compare records. 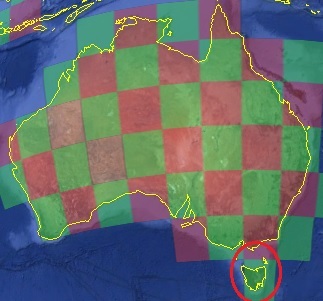 As you can see from the Google Earth image below, Tasmania fits fairly neatly into one 5 degree by 5 degree grid cell. And that comparison is not with raw data, but with CRUTEM4. 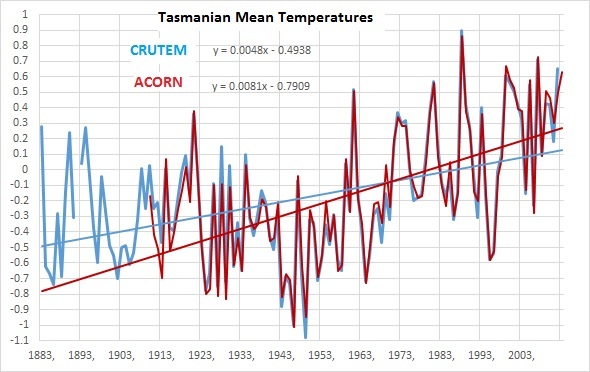 So, what is the correct temperature trend for Tasmania? The world acclaimed CRUTEM 4, or “world’s best practice” ACORN-SAT? Or neither? Jones P.D., Lister D.H., Osborn T.J., Harpham C., Salmon M. and Morice C.P., 2012: Hemispheric and large-scale land surface air temperature variations: an extensive revision and an update to 2010. Journal of Geophysical Research 117, D05127. doi: 10.1029/2011JD017139. You are currently browsing the kenskingdom blog archives for February, 2014.